Pedometers are popular give away items. 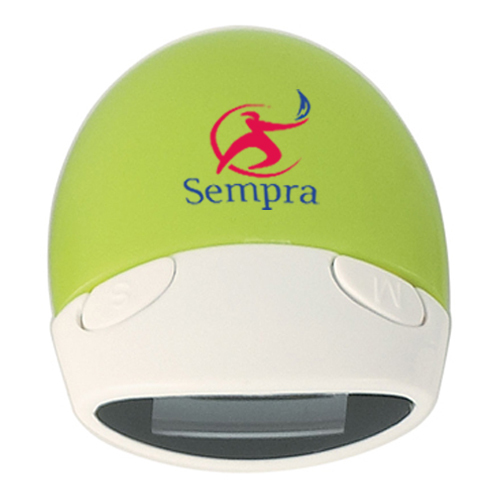 The custom multi function pedometers give enough space to imprint your brand name and logo. The lime green pedometers have a tangible value as a promotional gift as they help the users to keep an eye on their daily work out to attain a fit, well trimmed body. The easy to use tri functional provision makes it more efficient. It can display the steps taken from 1 to 99,999, the distance and the calories. It faces up for easy viewing. The personalized multi function pedometer travels long way with your customers routine activities as it could be clipped on anywhere with the clips molded on the back. Get your set of promotional multi function pedometers to promote your business.